AdWords is an advertising service created by Google for businesses wanting to display their ads on the search engine’s results page. Businesses are able to set an advertising budget and pay only when people click their ads. But how can you make sure that users do click your ads? How can you make sure that the right type of user is clicking your ads and your budget isn’t being drained by time wasters? You can never write ad copy that 100% guarantees a user will convert. If we could we’d all be millionaires! However, you can certainly create targeted, relevant and engaging copy that will highly increase your chances of doing so; and i’m going to show you how. As with all marketing, it’s crucial to know what action you want your audience to take before you create the content to support your product or service. This is never more important than when writing ad copy. Do you want to drive submissions of contact forms? Are you attracting people to download a free guide or do you simply want them to buy your latest item? Tell them what to do within the ad copy! As you can see from the example advert below, the advertiser is using imperative sentences such as ‘Sell Your Car Today’ and ‘Get A Free Valuation!’ as to make it clear to the user what they can do after they click the ad. What makes you different from your competitors? Why should the user buy from you rather than from them? What’s going to make them click your ad over the array of others/organic search results? As you can see in the example above, a record shop is differentiating itself from the competition by showcasing its USP (100% of profits go to charity). Don’t worry; we’re not suggesting you donate all your money to charity to stand out from the crowd but you get the idea! The last ad copy tip leads quite nicely onto this one; make sure to include any special offers or promotions that you are running that will appeal to your target audience. It’s similar to highlighting your USPs in the fact that if you have something great to say about your brand then say it! Why? Well although it does include a couple of promotions in the second line of ad copy, the two lines run into one sentence. Remember, each line of your ad copy should be individually understandable. Although being creative in your ad copy can be a good thing, being overly creative or complex can lead to dramatic fall offs in CTR. 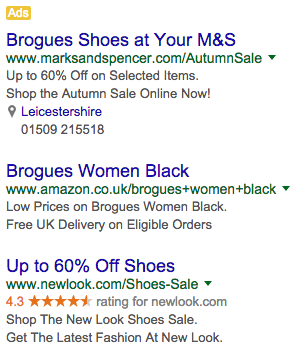 As you can see above, for the search term ‘Black Brogues’ the first two adverts from Marks & Spencer and Amazon both include the keyword ‘Brogues’ within the ad copy and therefore are much more appealing to a potential customer. Perhaps adding ‘Black’ would boost the CTR even further. Ad extensions are a type of ad format that show extra information about your business. It can be added manually or automatically. The idea is to increase the visibility of your adverts, increase the CTR and hopefully to garner more conversions. Bear in mind that, for most languages, you are given a limited space of 25 characters for the headline, 70 characters for description over two lines and 35 characters for the display URL in your ad copy. You don’t have much room to sell your product or service’s key features and every character has to count. This is why ad extensions can be so useful in driving more clicks. They give advertisers more space to promote their business and take up more room on the search engine results pages (SERPs). 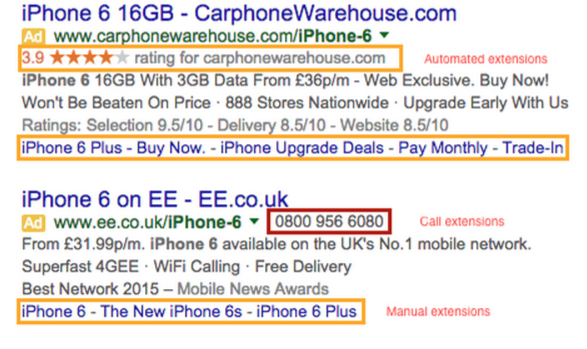 One or more extensions can appear with your ad if it will improve your campaign performance. Although, it is not guaranteed that it will show each time. Automated extensions are created and displayed via AdWords showing seller ratings, consumer ratings, social extensions and previous visits with the prediction of improving performance. The good thing about extensions is apart from the regular charges you pay for your ad, there’s no extra cost involved. 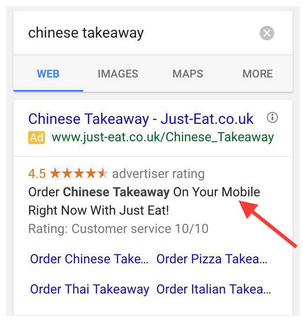 If the ad extensions contains certain interactions features such as app downloads, call buttons or location directions for example, you’ll be charged at the normal rate but Google doesn’t charge you for clicks on review extensions, social extensions or seller ratings. Consistency between your ad copy and your landing page content is crucial to avoid a high bounce rate. 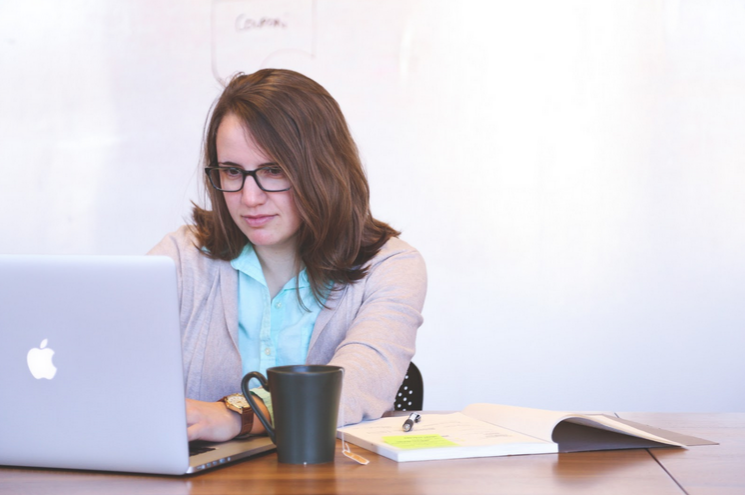 Assess your ad copy and ask yourself, if the user clicks through to my landing page will they find relevant content in relation to the ad? If not, then your ad copy needs tweaking. Having recently won the Bronze Award in Google’s very own ‘Ready to Rock’ AdWords Mobile competition, we here at Studio-40 understand just how important optimising your ad copy for mobile is for PPC success. It’s more than just common sense to suggest that users on mobile will have different wants and needs to those on desktop. It’s statistically proven. Mobile users often want information more quickly than desktop users and will be more prone to wanting to know your phone number and location. Optimise for this by creating mobile optimised ads, mobile specific CTA’s in the ad copy and adding location or call extensions. Try writing your ads with a customer focus, highlighting the benefits of your product or service and selling it as mandatory, not just desirable. To write with a customer focus in your ad copy, simply try addressing the reader rather than merely projecting your own features. By just writing ‘for your next outdoor adventure’ rather than JustFab’s basic description, Jack Wolfskin address the reader and create a scenario in which the reader could play the starring role. They are proposing a potential end goal rather than simply explaining the products that they have on offer. Consider testing ads that have seasonal, topical or timely information in the copy against those that don’t. By having current ads you can create an urgency in your product or service, make your ad seem more relevant than the competition and increase trust with the user. Conducting a search for ‘fancy dress shop’ in late September threw up the above results. 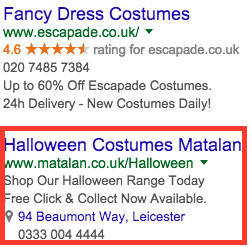 With Halloween just over a month away it very well may be the case that they’re after Halloween themed costumes and will choose to click Matalan’s ad rather than Escapade’s. As with the previous tip, it’s always a good idea to test ads against each other and experiment with a variety of ad copy. Whilst best practices are best practices for a reason, there are some hints and tips that will work for some campaigns and some that won’t. You should always create at least a couple of ads per ad group with different copy and CTA’s to see which performs best. AdWords automatically rotates ads to show the best performing ones more often but you should be constantly experimenting and looking to improve on performance.